My youngest daughter officially turned three months old last week. While weekly updates are not necessary, it seems like each month that passes during a child’s first year is a milestone to celebrate. They develop so exponentially during this time. They physically change right before your eyes. At three months, we are not required to take our children to the doctor for a well visit. 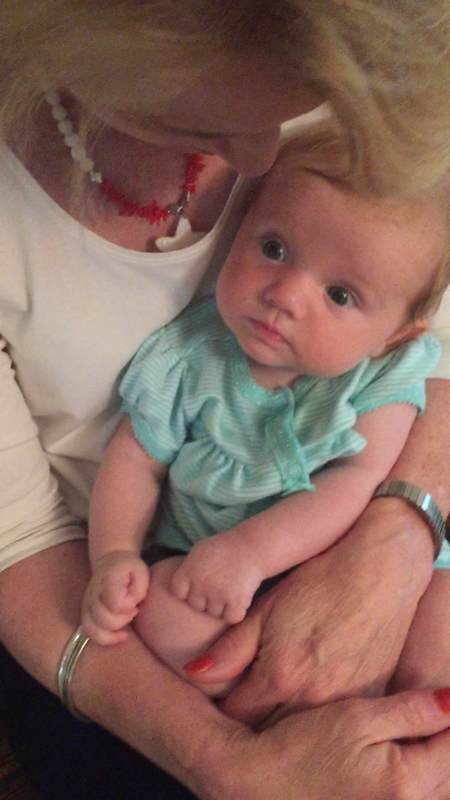 That said, it is difficult for us to guess what her actual height and weight were on her three month birthday. We did our best to approximate. My husband stood on our scale and weighed himself, prior to stepping back on the scale with our infant and weighing himself again. We then pulled out a tape measure and attempted to stretch her out to determine her height. If these measurements are right, this would place her in the 75th percentile for height and 69th percentile for weight. Yikes! 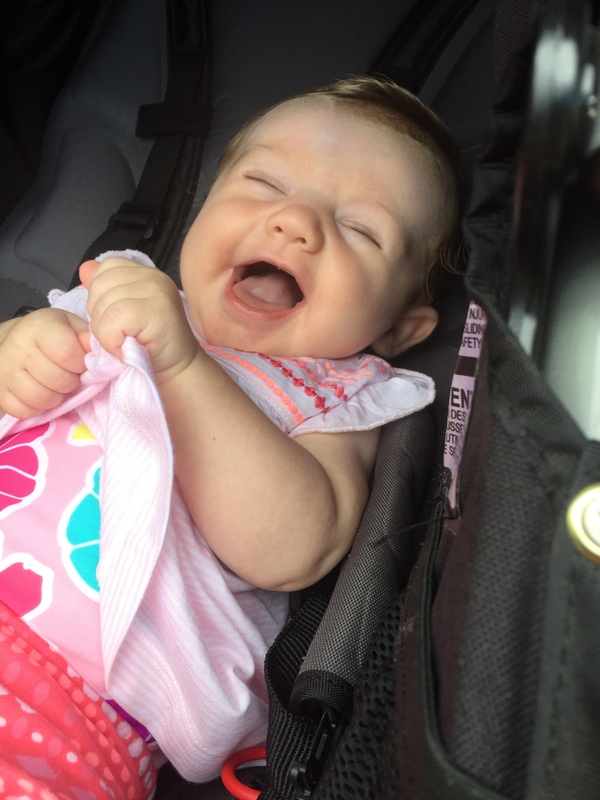 At four months, Madison only weighed 12 pounds, 8 ounces and 25 inches tall. It appears early on that they will be very different sizes as adults. For now, Madison has the advantage (and she uses that). However, I think her aggressiveness will come back to haunt her – when she is no longer the biggest one! 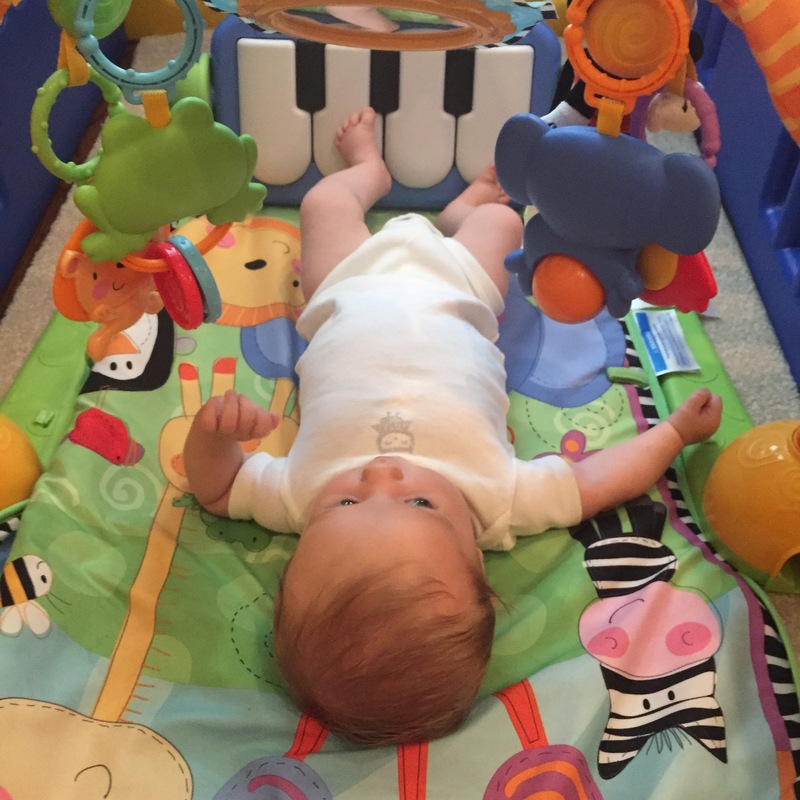 So what is my infant up to at three months? 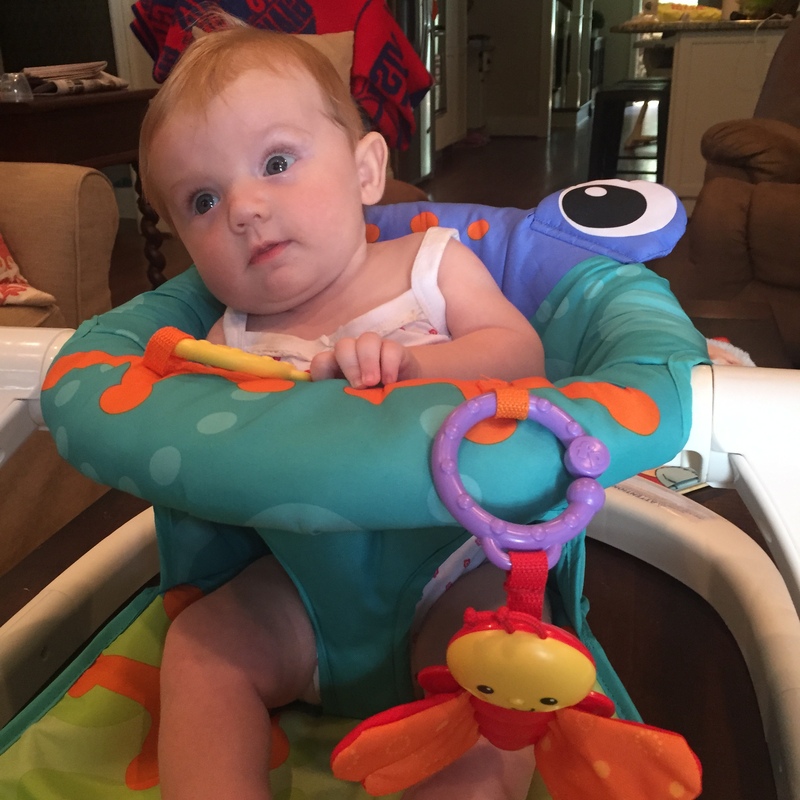 She is sitting up for brief periods of time in her “crabby” chair. It’s shaped like a crab. She is getting better at holding her head up. While she is not a big fan of tummy time, she is willing to tolerate this chair. She doesn’t necessarily cry when placed on her tummy, but she does not participate. She just lays there. She is a BIG fan of the playmat right now. My oldest daughter likes to try to play on it when our infant is using it. Clearly she has trouble sharing. I have explained that this is a baby toy and that she has an entire room of “big girl” toys. She does not care. She either wants to be around her sister OR she wants to take whatever toy that she is playing with. She loves when people talk to her and snuggle with her. My first daughter did not like to cuddle (or maybe she sensed that we didn’t know what we were doing). This has been an added surprise with baby number two. I never knew what it was like to have a baby that wanted to be loved on so much. If you want her to smile and/or laugh, just talk to her. All of the talking that I have been doing to her must be wearing off. She coos and attempts to respond back to me. 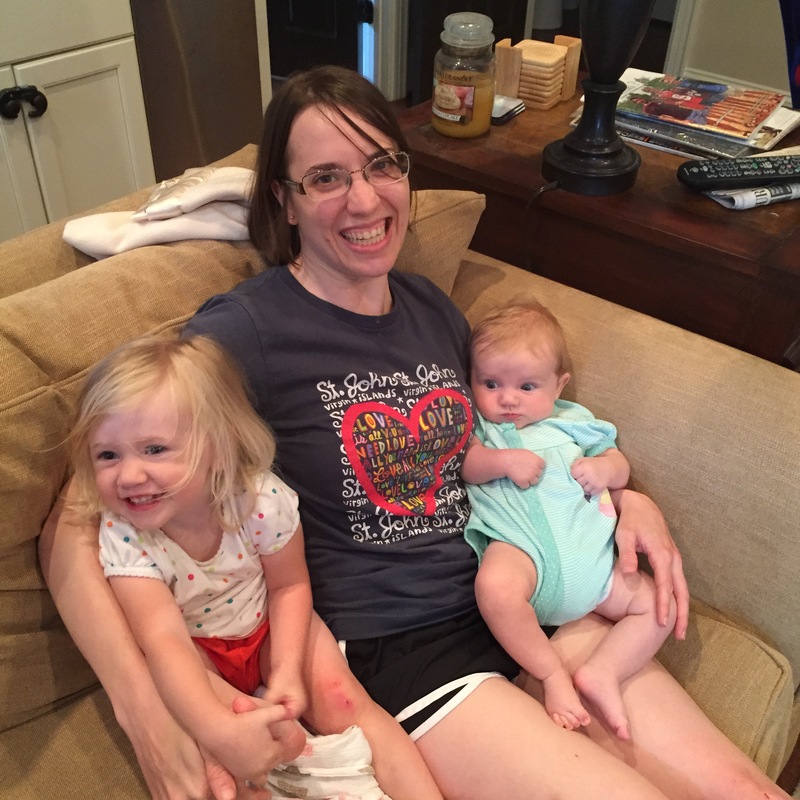 Our toddler still isn’t talking regularly to me, so maybe the youngest will start language development sooner? Naps are becoming less frequent, but night time sleeping has made a major turn. I have never been the type of parent that is good at getting my kids on a schedule. We are simply too busy. My children won’t nap unless I wear them out. 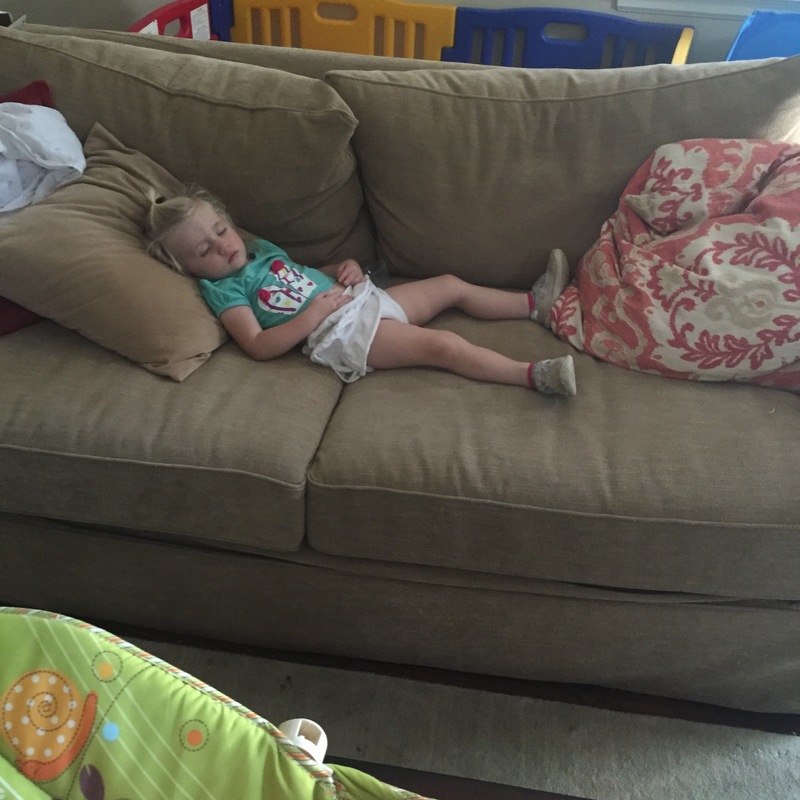 Unfortunately for my infant, this means that she gets drug around to all of my toddler’s activities and therefore oftentimes wakes up and falls asleep in random places. I will be happy to report that my infant is now happily sleeping in her crib for very long stretches at night. Typically she is in bed by 7:30PM and her first feeding is around 3:30-4:00 AM. I have to admit that whoever ends up feeding her at this time usually doesn’t go back to bed (we savor the few hours we have to work, work out or watch Bravo). While I haven’t been one to get my kids on much of a feeding schedule, I have made an effort to find activities to do each morning over the summer. My oldest daughter is now only napping in the afternoon. If I can wear her out in the morning, she will typically take a two hour nap in the afternoon, leaving just a few hours before dad gets home. 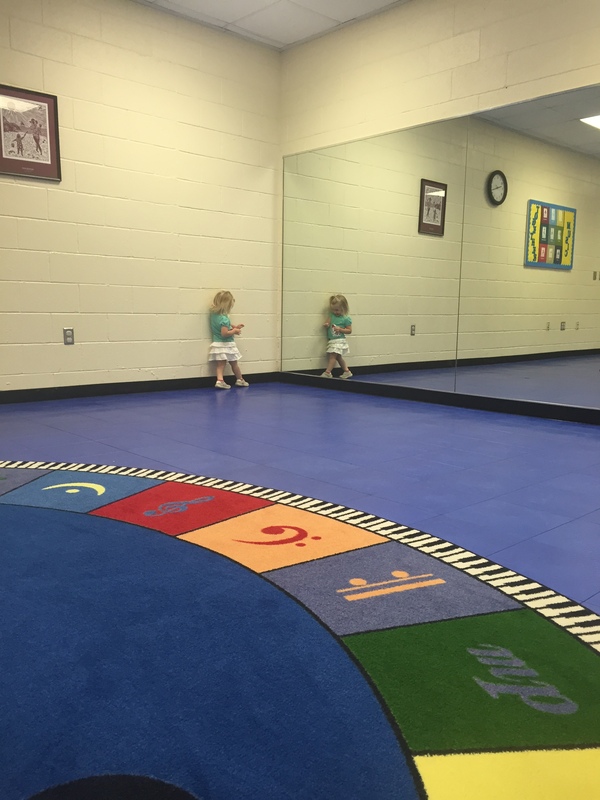 We started music class this summer. See picture above. This was taken way before class started – no pictures allowed in actual class. Both kids actually love the class. They gave us a CD to take home that includes music that we sing in class. I have been playing it in the afternoons when things start to get out of control (as an alternative to TV). My toddler gets so excited when I turn it on. Dancing. Tapping with our wooden spoons. Lots of smiles. We have gone uptown at least once a week each week to visit my husband for lunch. While it is a major effort on my part to get them both packed up and physically there, it really makes their day to see their dad. Running hugs. Walks. Rides up and down the escalator. Who needs Carowinds when you can ride up and down the escalators and run through the Overstreet Mall? There are even healthy food options uptown. While a place named “Johnny Burrito” might sound like a bad a idea, I found an amazing healthy salad. There are chips at the bottom, but since they hide them, you can avoid them. 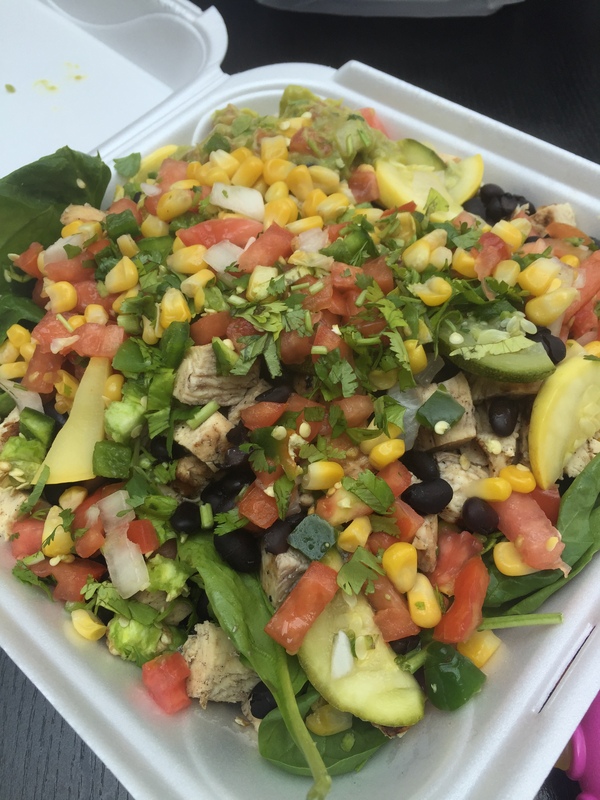 Greens, squash, pico, jalapeños, chicken, black beans, corn and guacamole. I actually could only eat about three quarters of the meal. My daughter and husband ate the rest. 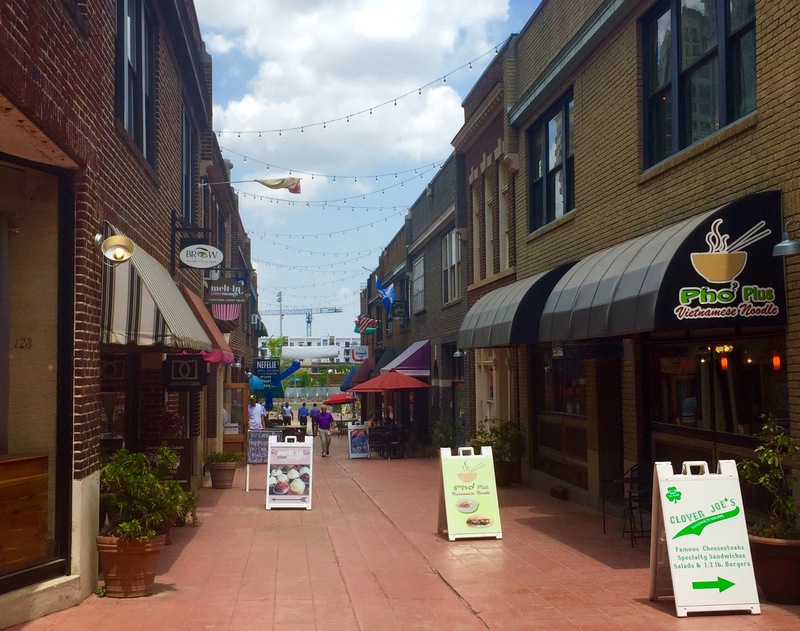 There are so many great areas for children to explore uptown. 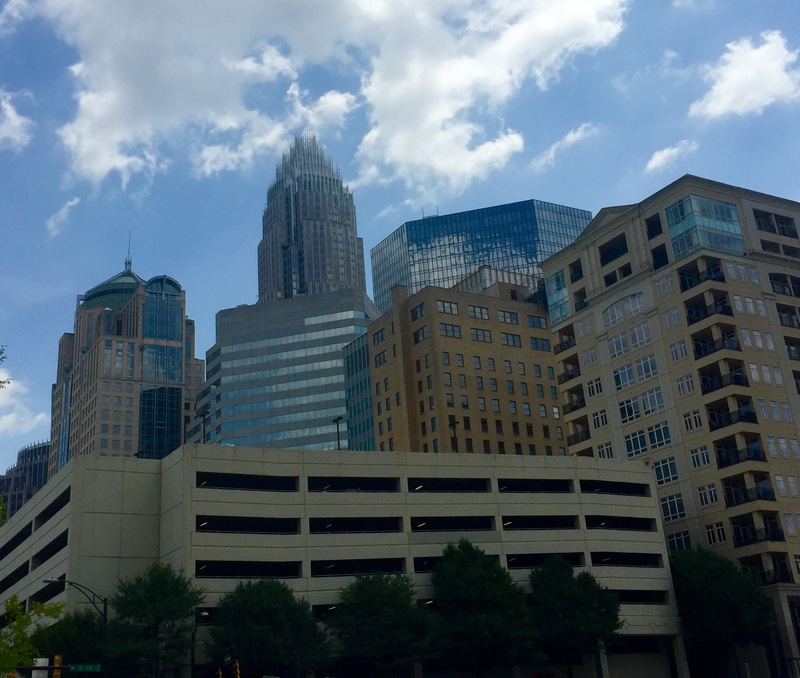 After lunch in the atrium at Wells Fargo, we walked across the street, through Latta Arcade and across a second street into Romare Bearden Park. Heat and all, my daughters loved it. So much so, they both passed out when they got home. Mommy time. A moment of peace. I may have even fallen asleep for a few minutes? Time is going by quick. 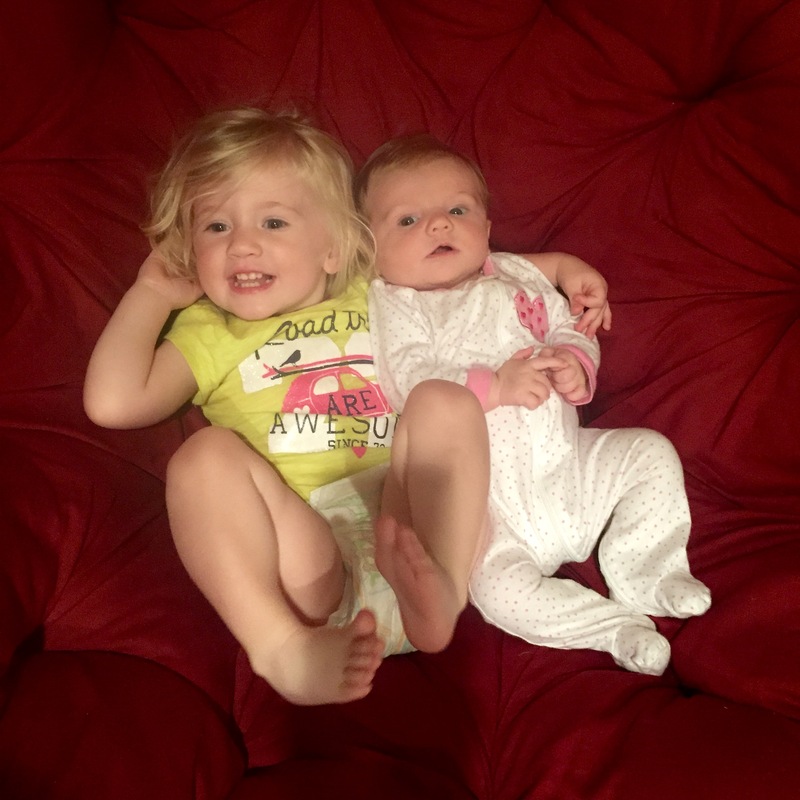 It’s hard to believe that both girls are growing up so fast. While each day of the summer seems to be so difficult to fill, somehow the day is over before I know it. I just have to take a step back and enjoy it. 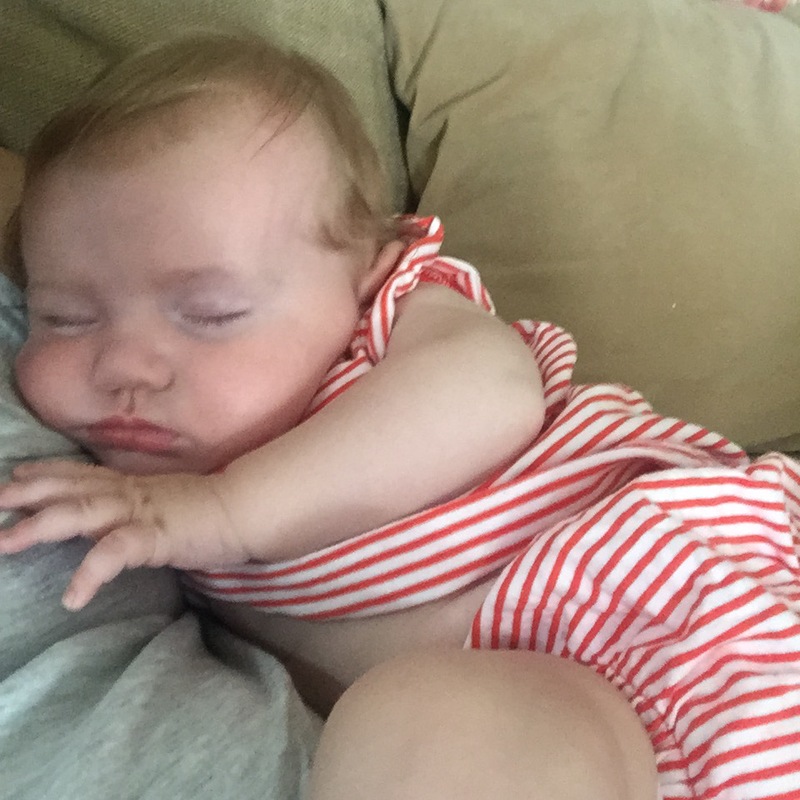 This entry was posted in babies, Staying fit and tagged three month old on June 25, 2015 by flyjenduf.